Requesting New Electric Service Installation | Delaware County Electric Cooperative, Inc. When requesting electric service to a new home or parcel please refer to the information, and steps that will need to be taken, listed below. 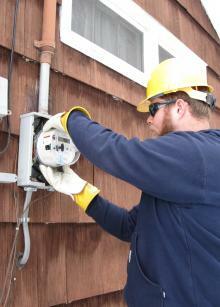 These steps will be required in order to construct the electric service and energize your property. Upon the applicant completing the above requirements, a meeting at the site will be scheduled with the applicant and DCEC personnel to assess the site and gather the necessary information to allow the Cooperative to develop a plan for providing service and cost to the applicant. Provide wiring inspection on service entrance – refer to specification for type of secondary service installation - meter base to be purchased at the Cooperative or at a third party vendor. Pay for other related permit and acquisition costs related to project. the construction of the new service. Pay additional costs if applicant requests and the Cooperative approves an alternate method or route of construction. Reapply if the project does not proceed within 24 months. Rock blasting, tree clearing, multiple riser poles, multiple transformers, need for off-road equipment, meter pole and other extraordinary costs will be over and above $14.00 per foot. Extraordinary costs are charged to the member based on estimated time and materials. Please review the Line Extension Policy for New Service by CLICKING HERE for additional information. Please note that line extensions will require the member to be responsible for a 2-year minimum charge from the date service was made available. All other new services will require a one-year minimum charge from the date service was made available. In certain circumstances, DCEC may include incremental facilities in the project design that will benefit future projects. The costs for these added facilities will not be the responsibility of the applicant.